SOS Children's Villages has been present in Sudan since the mid-1970s, when it began its work in the capital city of Khartoum. The armed conflicts, which have been going on for five decades, have had a devastating effect on the lives of the Sudanese population. In addition to long term programmes which provide support to families and children, our organisation has also run emergency relief programmes in areas which have been badly affected by war and natural disasters. Two girls in our care from SOS Children's Village Khartoum (photo: SOS archives). The population of Sudan is around 35.4 million (July 2014 est. ), with the capital city of Khartoum being home to five million people. Sudan's recent history of armed conflicts has affected all areas of social, economic and political life. The fighting of the past 50 years has cost over 1.5 million lives. Hundreds of thousands have been killed and about two million have been displaced during fighting in Darfur. In 2011, further conflicts in South Kordofan and the Blue Nile State caused additional suffering for the local population. Sudan has one of the highest rates of internally displaced people in the world: around four million people have had to leave their homes. Others have sought refuge in neighbouring countries; many from Darfur have fled to Chad and those from the Blue Nile State into neighbouring Eritrea. Sudan is one of the least developed countries in the world. Not only has its infrastructure been destroyed by years of conflict, but to make matters worse, the country is often hit by natural disasters. Over 45 per cent of the population does not have access to improved drinking water. Furthermore, over 76 per cent of the population has no access to sanitation facilities. The lack of adequate infrastructure puts many at risk of epidemics. Although large parts of the country are in dire need of humanitarian aid, armed conflict and lack of infrastructure make it difficult for international organisations to reach the population in need. Up until 2010, Sudan's economy grew thanks to profits gained from the extraction of oil. However, when South Sudan became independent in July 2011, Sudan lost 75 per cent of its oil reserves. Sudan continues to have control over the pipelines, refineries and export terminals, and can earn some income by charging South Sudan for the use of these facilities. The population of Sudan felt the effects of South Sudan's independence: food prices rose and there were persistent shortages in foreign currencies . The economy of Sudan had to adapt to the changing political situation. At present, agriculture continues to play an important role in the economy. In 2011, the International Monetary Fund advised the government to develop this sector alongside light industries. It is, however, feared that many will remain below the poverty line for years to come. The official unemployment rate stands at around 20 per cent. There are widespread inequalities in Sudan, with marked variations between different regions of the country. While the northern states tend to be wealthier, more urbanised and less dependent on agriculture, other areas such as Darfur, South Kordofan and the Blue Nile State are not as prosperous. The latter have a higher infant mortality rate and a growing number of households with poor food consumption. While 31-40 per cent of households in Kordofan do not have enough food, residents of war-affected Darfur are largely dependent on food aid. The children living in these areas are less likely to complete primary school - in Darfour and Kordofan less than five per cent finish school, in contrast to fifty per cent in the wealthier north. Sudan is, demographically speaking a very young country: around 41 per cent of the population is under the age of 14. 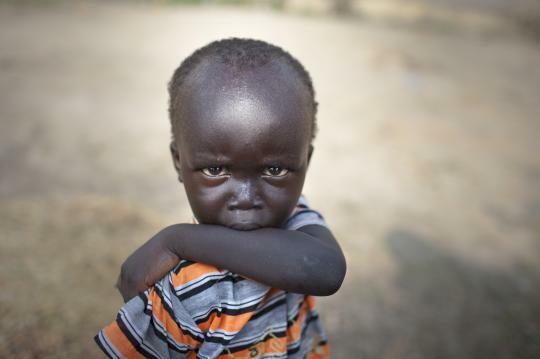 In a country characterised by armed conflict and natural disaster, the children are amongst the worst affected. Families and communities have been pulled apart and an estimated 3.5 million children are without parental care. In addition, many children lose parental care due to poverty. Graduating from the SOS Kindergarten and looking forward to going to school (photo: SOS archives). Child labour is widespread. Children are forced to work in factories or in informal sectors such as shoe shining, car washing, and street vending. Other children resort to begging as a way of making some money. In rural areas children work in farming and animal rearing. The trafficking of children for prostitution or sexual abuse remains a problem. 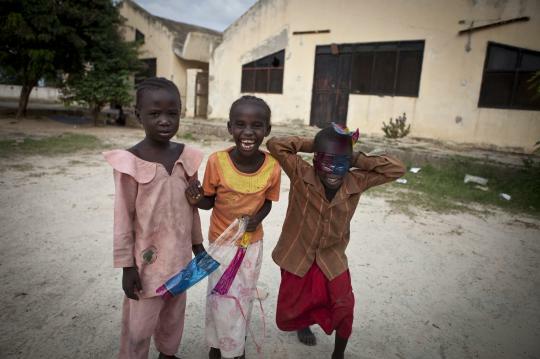 In areas affected by armed conflict, many children are recruited as child soldiers. Girls are particularly disadvantaged as they are less likely to get an education and are often forced to marry at a young age. The decades of armed conflicts, tense political situation, economic changes and natural disasters which Sudan has endured have led to a particularly intense involvement of SOS Children's Villages in the country. The activities of our organisation have responded to the changing needs of local children, young people and families. For example, in response to the on-going conflicts in Darfur our organisation started an emergency relief programme to support refugees by providing them with housing, counselling, training and work. In the more permanent premises in Khartoum, young children can attend the SOS Kindergarten, or the SOS Hermann Gmeiner primary schools. The Family Strengthening Programme works with local agencies to enable children who are at risk of losing the care of their family to grow within a loving family environment. When children can no longer stay with their families, they are cared for by their SOS mothers in one of the SOS families. Young people can live in special houses where they are guided on their way to an independent life by professionals.